The early start didn't prevent royal wedding fans from turning up as early as 4:15 this morning to watch the nuptials under the arch in DUMBO. We've got all the coverage here, but be sure to check out the DUMBO BID's Facebook page, as they post more photos from the photo booth and costume contest, which you can vote for your favorite via "likes." The winner will receive a gift certificate to a DUMBO business. DUMBO, Brooklyn Heights: Wills and Kate may already be wed, but the party continues all day long in DUMBO, under the Archway, and at the Chip Shop on Atlantic Avenue. Park Slope: Move to the electronic R&B stylings of Body Talk at Southpaw. Or, if you're in the mood for some awesome aerial feats, head to the Brooklyn Lyceum of "Insectinside." 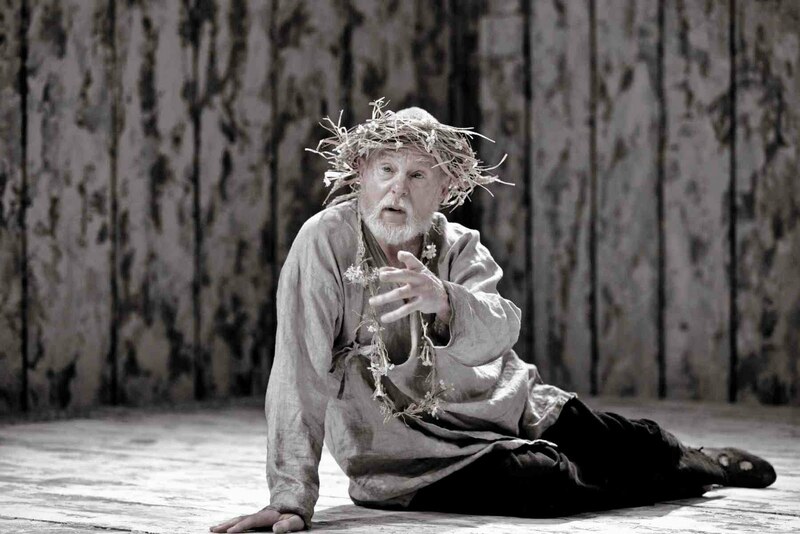 Fort Greene: Derek Jacobi stars in the titular role in Donmar Warehouse's production of "King Lear," running at the Brooklyn Academy of Music through the beginning of June. 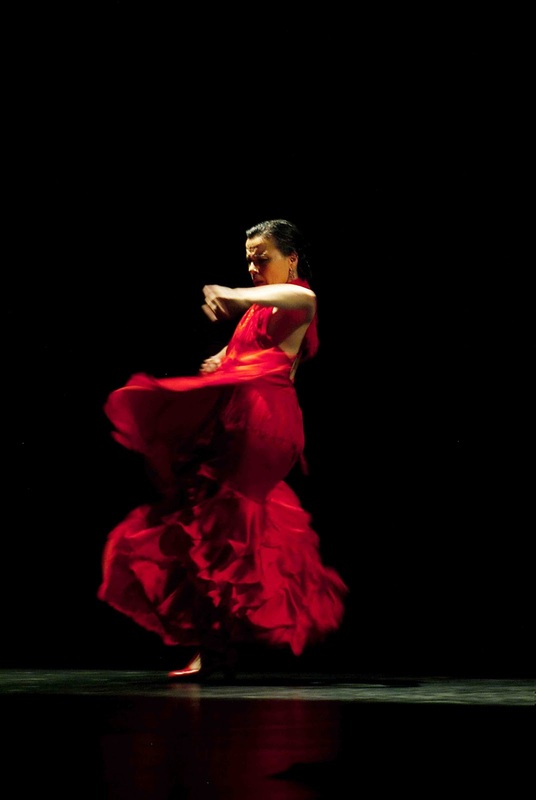 Manhattan Beach: Noche Flamenca brings flamenco to the Kingsborough Performing Arts Center, straight from Spain, in its new show, "ALBA." Cobble Hill: Find all your Brooklyn favorites in By Brooklyn, a new boutique opening today on Smith Street. Park Slope: Lots more going on in Park Slope today, from the veteran art at Prophecies Gallery — you can't miss it, the entrance is covered by a bunker! — to the Spring Craft Market at the Brooklyn Lyceum (also Sunday), to the Fifth Avenue Family Festival at the Old Stone House. Fort Greene: If you're in the mood for an eco-friendly vacation, look no further than One Skylight Hanson, which hosts Green Getaways, a green travel expo, today. Crown Heights: Sakura Matsuri, the annual cherry blossom festival, returns to the Brooklyn Botanic Garden this weekend — which should be especially poignant this year in the wake of the earthquake and tsunami in Japan in March. Brooklyn Heights: Take a look at how the other half lives — the kind that lives in 100-year-old renovated townhouses — when the Brooklyn Heights Association throws its annual house and garden tour today. Attention, local shoppers: your one-stop-shop for all your Brooklyn product needs is almost here. By Brooklyn, a new boutique opening in the old Stinky Brooklyn location on Smith Street this Saturday, has one rule — if it’s made in Brooklyn, it’s for sale. “People are so ‘rah-rah Brooklyn’ now,” said Cobble Hill resident Gaia DiLoreto, who was inspired to hop abroad the Brooklyn bandwagon after getting frustrated that she couldn’t find all the things she loved in one convenient place. So, By Brooklyn will feature all her favorite Brooklyn-made goodies, from stationery to T-shirts to jewelry to lotions, including Goldie’s Soap, which makes its products using lard from the Meat Hook. On the food front, there will be Early Bird Granola, jam from Anarchy in a Jar, and pickles from Sour Puss Pickles and, eventually, Brooklyn Brine (pictured). 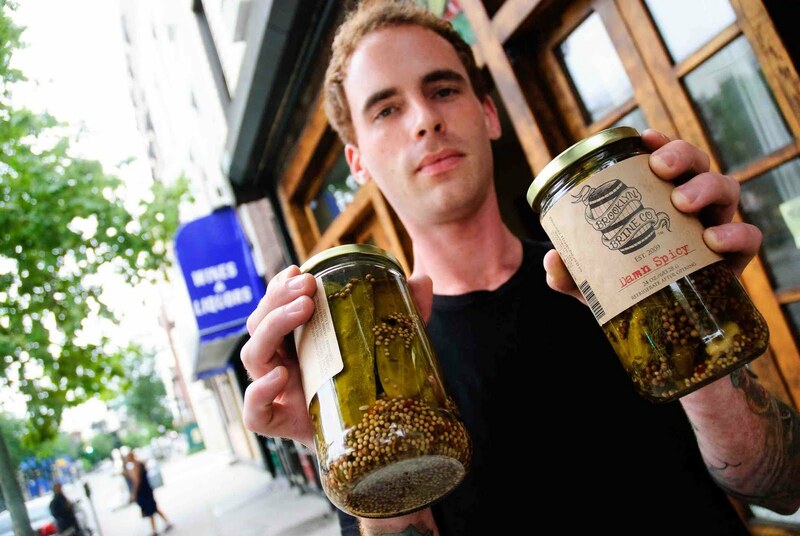 Vendors, for their part, are excited to join the borough-centric venture. 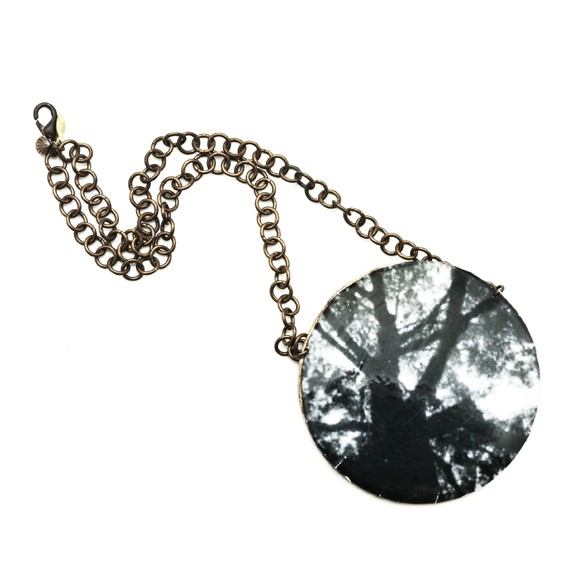 Not only are items made here, they often take inspiration from its environs. Take, for instance, pint glasses stamped with such iconic Brooklyn images as the Brooklyn Bridge and Cyclone from Smith Street’s Brooklyn Tattoo, and quilts from Atlantic Avenue’s Melting Pot that feature a map of the borough. “I buy it for all my friends who have babies,” said DiLoreto. In addition to featuring local vendors, it was important to DiLoreto that the offerings span the spectrum from old school to new. To that end, the shop will have Manhattan Special Soda, which has been making its espresso coffee soda in the borough for more than 100 years, next to Fresh Ginger Ginger Ale by Bruce Cost, the new kid on the block. By Brooklyn (261 Smith St. near Degraw Street in Cobble Hill, no phone), opening April 30 at 11 am. For info, visit www.bybrooklyn.com. Your eyes aren’t deceiving you — among the brownstones of Park Slope, you can find a bona fide bunker. 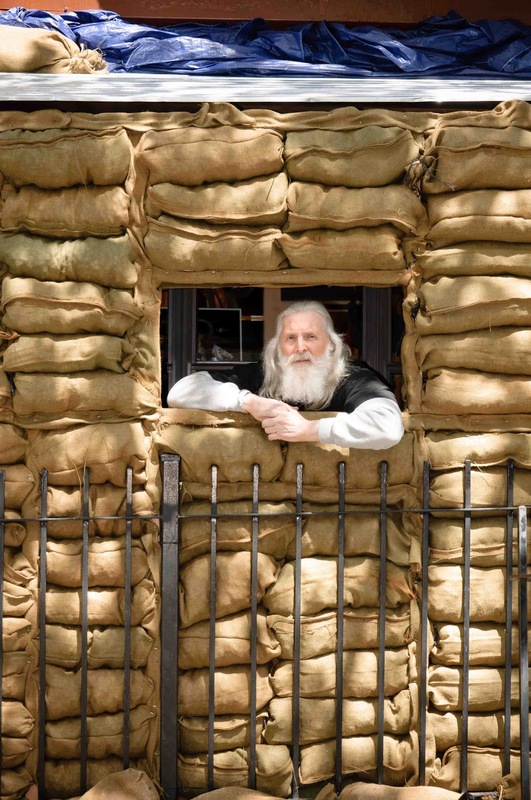 On the sidewalk of President Street near Fifth Avenue sit neat stacks of olive burlap sandbags, an empty window carved out where an M60 would be right at home. It’s no Vietnam war memorial or unconventional yard decoration, but part of a new exhibition at Prophecies Gallery opening on Saturday featuring artwork by veterans. Gallery owner Lenny Goodstein spent 12 hours building the bunker with some of the featured artists as a way to draw people in to his new show. The bunker certainly draws attention — spend a few minutes inside it, and you’re likely to see people taking photos or popping their heads in to get a closer look. Ultimately, though, the bunker’s meant to draw you into the gallery, where you’re first greeted by a window installation featuring the artifacts of war — helmets from World War I, II and Vietnam, a Green Beret uniform and a sculpture of a helicopter. Inside, the walls of the gallery barely show any white, covered with a variety of pieces, from oils to needlepoint to sculpture to photography — some of it abstract, but most of it related to the artist’s experience, such as Domingo Vega’s colorful paintings of battlefields to Tony Velez’s black-and-white photographs of Vietnam War protesters. Many of the 23 artists, a group that includes male and female veterans who have served in wars from Vietnam up until the present day, are from Brooklyn and the outlying boroughs. Goodstein has received mailed-in submissions from veterans in Kansas, South Carolina and Virginia once word spread about the show, though the gallery is only a little bit bigger than the size of an apartment lobby. Proceeds from the sale of the artwork will go to the Veterans Quality of Life/Access Network, which helps homeless veterans find shelter and receive benefits — further driving Goodstein’s cause home. Veterans art show at Prophecies Gallery [665 President St. near Fifth Avenue in Park Slope, (718) 230-3022], Tuesday through Sunday, April 30-May 31, 11 am-7 pm. Opening night party, 4-8 pm. May kicks off house tour season, when you can get a peek inside your neighbors’ home and their elaborate dining rooms, rare art pieces and innovative renovations. First up are 10 homes in Clinton Hill, as well as properties in Wallabout, that includes gardens, a mansion, an artist’s studio, and a French revival Gothic church. Then, on May 7, you can explore Brooklyn Heights and its historic townhouses. 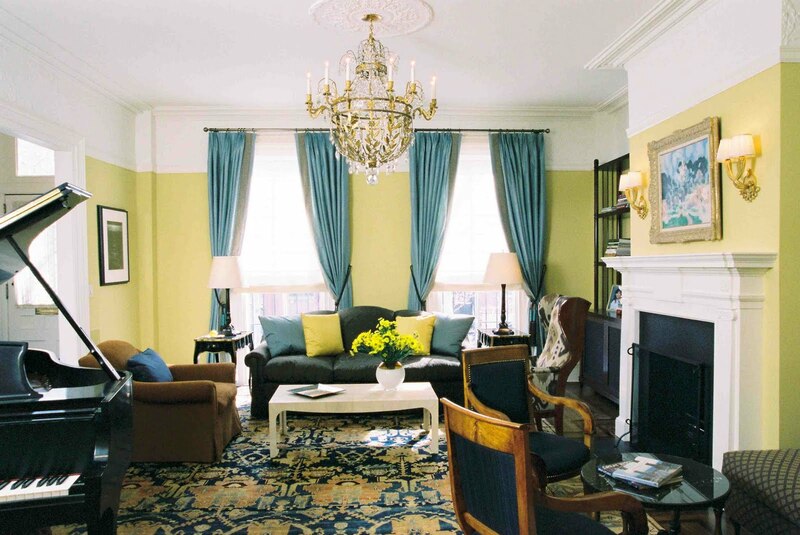 Highlights include a nearly 170-year-old Greek Revival brick townhouse owned by an artist; a Federal-style house renovated by famed New York architect William Tubby; and the oldest house on the tour, built in 1826, which features Parisian chandeliers, a dining room table where Winston Churchill once ate, and a garden with a cherry tree. Both tours are self-guided, so you can take your time. Just please, no photos. Clinton Hill house tour starts at the Queens of All Saints Church [300 Vanderbilt Ave. between Dekalb and Lafayette avenues in Clinton Hill, (718) 638-7625], May 1, noon-5 pm. Tickets $25. For info, visit sctyclintonhill.tumblr.com; Brooklyn Heights house tour starts at St. Ann’s School [129 Pierrepont St. between Clinton and Henry Streets in Brooklyn Heights, 718-858-9193], May 7, 1-5 pm. Tickets $40. Reservations recommended. For info, visit www.thebha.org. For your next vacation, think green. That’s the message travel website EscapeMaker is sending when it hosts an eco-friendly vacation destination expo on Sunday at Skylight One Hanson. 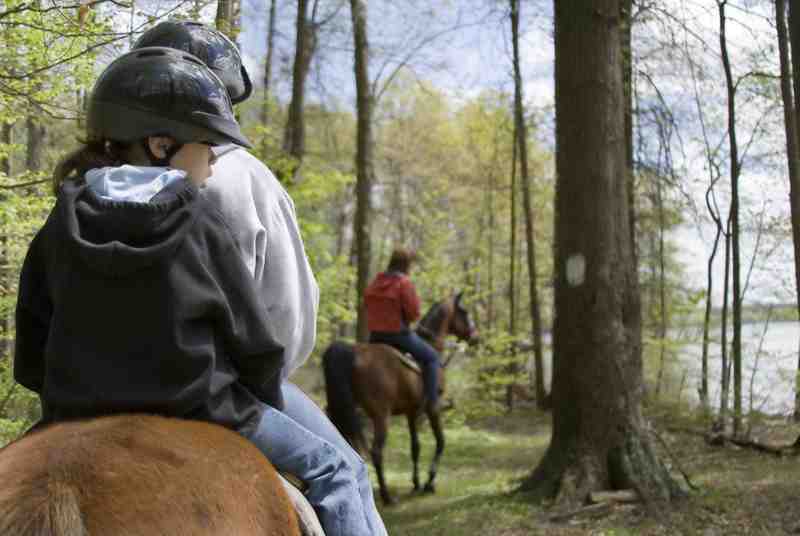 There’ll be wine tastings from New York vineyards, farm-fresh food samples, live music and dozens of weekend getaway deals for the outdoorsy sect. “It’s a fun way to be conscious of the environment and improve our way of life,” said Park Slope resident and expo participant Ed Fondiller, founder of the Catskill-based Total Tennis, whose eco-friendly camp features meals made from an organic farm and grounds lit by solar panels. Plus, like the other facilities and farms featured at the expo, it’s located only a day’s drive or train ride from Brooklyn, so your trip will leave a minimum carbon footprint. For people who want to travel green without spending green, the Expo is raffling off trips that include a zipline adventure tour upstate and an overnight stay at the lakeside Mohonk Mountain House and Spa. And if a getaway to a mountain house with a geothermal heating cooling system isn’t enough to drive the green message home, Expo attendees can also take part in a green market quiz game and recycling workshop. So even if you don’t book a trip to the Meditation Barn in Vermont, you’re guaranteed to walk away from the Expo with something useful. EscapeMaker’s Green Getaways at Skylight One Hanson [1 Hanson Pl. near Flatbush Avenue in Fort Greene, (718) 230-0400], April 30 from 11 am to 5 pm. Tickets $10 in advance, $12 at the door. For info, visit www.escapemaker.com. Spring’s in full swing, and so are flea markets, shopping parties and expansions in this week’s Market Watch. More than 60 craftspeople will descend on the Brooklyn Lyceum in Park Slope on April 30 and May 1 for its annual Spring Craft Market. There’ll also be music, food and drink to also entertain, but don’t waste this opportunity to score a gift for the mother in your life, as Mother’s Day is fast approaching on May 8. Spring Craft Market at the Brooklyn Lyceum [227 Fourth Ave. at President Street in Park Slope, (718) 857-4816], April 30 and May 1 from 11 am-7 pm. Free admission. For info, visit www.lyceummarkets.com. For the shopping set, here’s a Cinco de Mayo event you can get on board with. Shopping party planner Jovi, The Brooklyn Social brings its popular “Girls Night Out” event to Capri in Bay Ridge on May 5, when you can find dozens of clothes and accessories vendors, as well as nutrition products and fitness professionals, to help you look your best this spring. You can also enjoy a margarita at the open bar, tapas from Hom Boutique and Cafe, and the chance to win prizes. “Girls Night Out” at Capri [437 88th St. near Fifth Avenue in Bay Ridge, (718) 748-1002], May 5 from 6-10 pm. Tickets $30. The Fulton Flea is back for another spring and summer season. Running every Sunday starting May 8, the Brooklyn Plaza Fulton Flea will be home to a variety of artisan goods, products, and and food from local residents and businesses in Fort Greene. Brooklyn Plaza Fulton Flea [650 Fulton St. between Fort Greene Place and S. Elliott Place in Fort Greene, (917) 364-5648], Sundays starting May 8 from 11 am-6:30 pm. For info, visit www.fultonflea.com. The old Jodi Arnold space next to Steven Alan on Atlantic Avenue has a new tenant — Steven Alan. Racked reports that the designer is essentially doubling in size in Boerum Hill as it takes advantage of the vacant space next store, which became open when designer Jodi Arnold closed in December, to have his and hers store. Each space, the original at 349 Atlantic Ave., the other at 347 Atlantic Ave., won’t be accessible from the other, but in case you’re shopping for both sexes, they’re still only right next door to each other. The new space is expected to open this week. Steven Alan [347 and 349 Atlantic Ave. near Hoyt Street in Boerum Hill, (718) 852-3257]. This one’s for the kids. On Saturday, the Fifth Avenue Family Festival returns to Park Slope for the second year in a row, with festivities for the whole gang along Fourth Street, between Washington Park and MS 51. 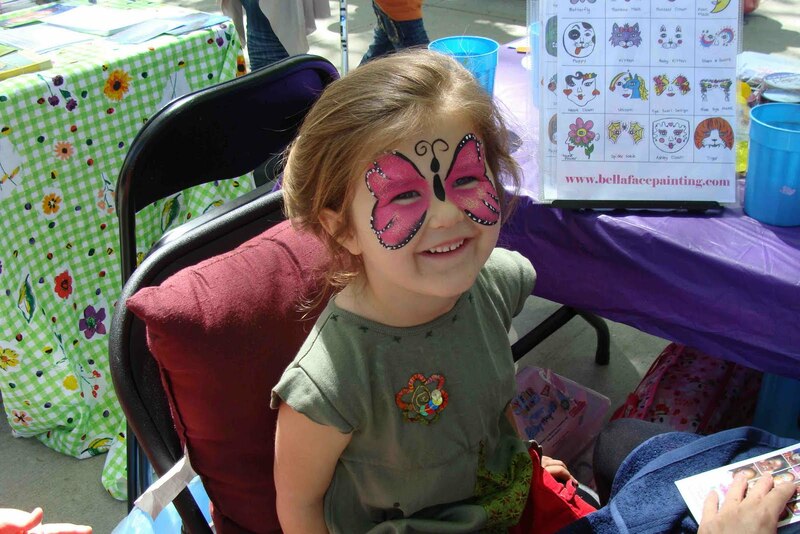 During the fair, hosted by the Fifth Avenue BID and the Park Slope-based children’s theater Puppetry Arts, get your fill of face paintings, puppet-making crafts, and prizes. Brooklyn Cyclones mascot Sandy the Seagull will also be there, overseeing a batting cage, and Stormtroopers and Jedi Knights will be ready for photo-ops, courtesy of the 501st Empire City Garrison and Echo Base Rebel Legion, two Star Wars fan groups. Fifth Avenue Family Festival [Fifth Avenue and Fourth Street in Park Slope, (718) 768-3703], April 30 from 11 am to 4 pm. Free. For info, visit www.puppetryarts.org. Royal wedding fever has officially crossed the pond. 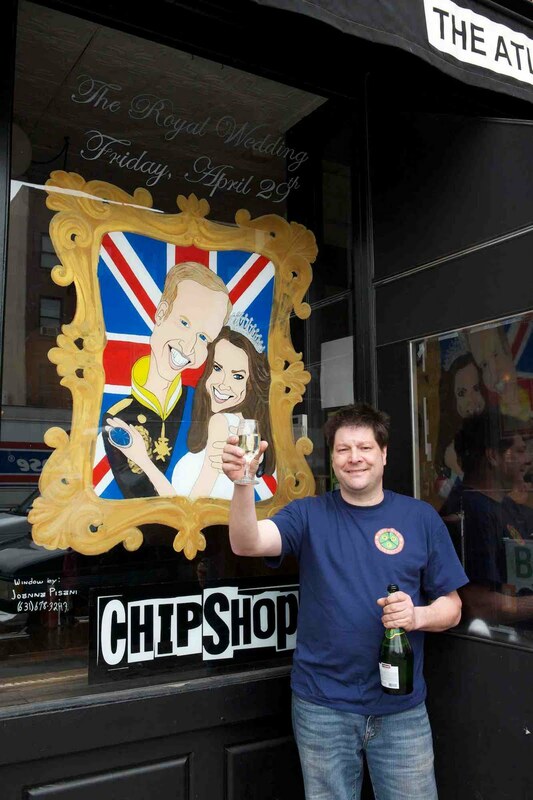 When Prince William and Catherine Middleton wed in Westminster Abbey on April 29, you can count on Brooklyn Heights’s Chip Shop to throw a bloody good party. For the past few weeks now, the restaurant has featured a caricature of Wills and Kate in its front window, leading up to the wedding. On the big day, you can celebrate the British couple by dining on traditional “old boys club” type food, including kippers — smoked herring — and kedgeree — a curried rice with smoked haddock and hard-boiled eggs. For his part, Sell, a native of Rugby, England, approves of the union. Chip Shop’s festivities, which also include a royal quiz and champagne toast, kick off at 11 am. That’s a few hours behind the official wedding service, which begins at 11 am UK time, 5 am Brooklyn — a wee bit too early to start drinking here. All you early risers, though, can beat the sun and head to the Archway in DUMBO to watch the wedding live, as the DUMBO Improvement District throws a party there beginning at 5:30 am. Dress festively — think fancy hats or coming as your favorite royal — to participate in contests and get your photo taken at an on-site photobooth. For the late-risers, the party will continue with a replaying of BBC America’s coverage following the live action. Royal wedding party at Chip Shop [129 Atlantic Ave. between Henry and Clinton streets in Brooklyn Heights, (718) 855-7775], April 29 starting at 11 am. 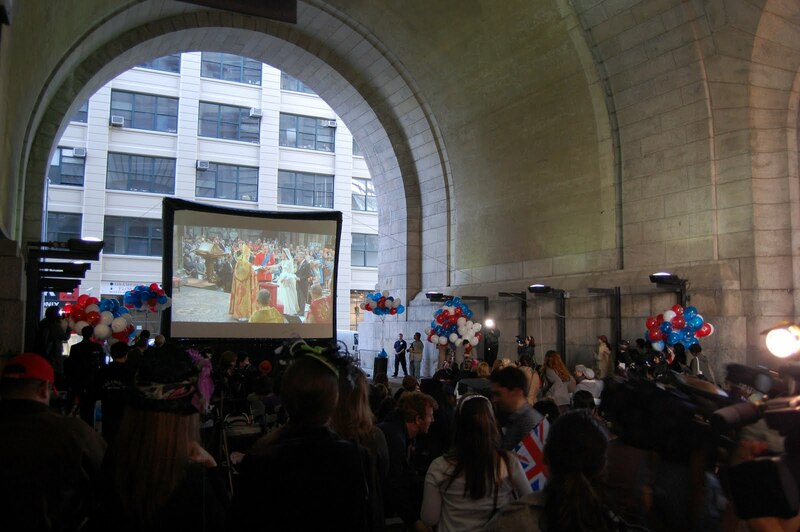 For info, visit chipshopnyc.com; Royal wedding viewing at the DUMBO Archway [Pearl Street at the Manhattan Bridge, (718) 237-8700], April 29 beginning at 5:30 am. Free. For info, visit www.facebook.com/dumbo.bid. This flamenco show’s got it all. “We have a very tragic piece about loss, a comedic number, a piece about man’s virility and an alegrias – a duet – about the joy of love,” said Martin Santangelo, artistic director of Noche Flamenca, which is based in Spain — the birthplace of the dance form. Santangelo founded the Madrid-based troupe with his dancer wife, Soledad Barrio, in 1993, and today it consists of three dancers, as well as two guitarists and two singers, the latter of which bring real depth to the performances. In “ALBA,” for instance, vocalists sing from a poem about the Abraham Lincoln Brigaders, who battled Fascism in Spain in the 1930s. For flamenco fans who aren’t content to just watch others perform, Santangelo is hosting a free dance lesson an hour-and-a-half before the show. But space is limited, so don’t waste any time reserving your spot! Noche Flamenca at the Kingsborough Performing Arts Center at Kingsborough Community College [2001 Oriental Blvd. at Decatur Avenue in Manhattan Beach, (718) 368-5596], April 29 at 8 pm. Tickets $30. For info, visit www.kcckpac.org. All four members of Body Language have clearly defined roles. Matthew Young writes most of the lyrics. Ian Chang creates crazy beats on the drums. Grant Wheeler mans the keys. And Angelica Bess? Well, she adds the sparkle. 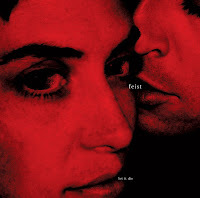 Her Lily Allen-esque voice (minus the British accent) has attracted the likes of Michael Angelakos in Passion Pit and Whale Belly, whom she’s done backing vocals for. 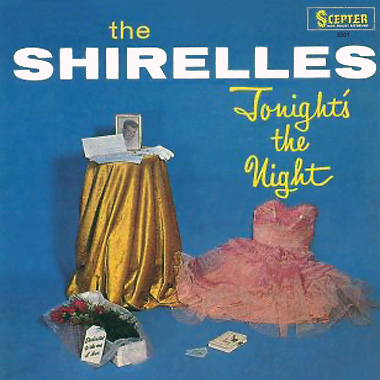 Together, Young, Wheeler and Bess also used to back for Theophilus London before he went solo. When Chang got on board, Body Language — and its electronic, R&B, Tropicalia sound — was born. 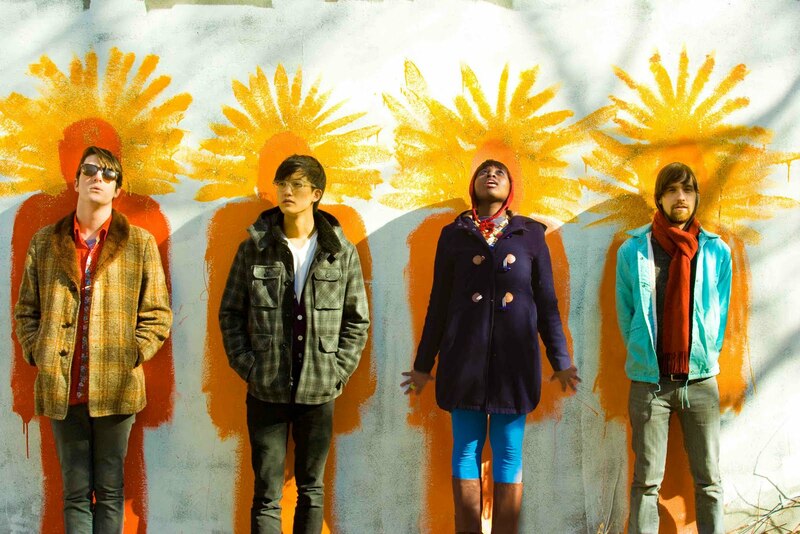 The band’s most-recent EP, “Social Studies,” has attracted fans for its danceable grooves, and lately, the quartet’s been in Young and Wheeler’s Clinton Hill-based studio to churn out more, which they’ll bring to Southpaw this Friday for a show with Melo-X. It must be the sparkle. 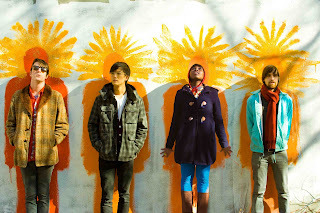 Body Language at Southpaw [125 Fifth Ave. at Sterling Place in Park Slope, (718) 230-0236], April 29 at 9 pm. Tickets $10 in advance, $12 at the door. For info, visit www.spsounds.com. The Tony Award-winning actor stars in Donmar Warehouse’s production of Shakespeare’s masterpiece, running at the Brooklyn Academy of Music starting this Thursday. After decades on stage, Jacobi, a master of Shakespeare’s verse, is up to the task of portraying the aging monarch, who, after offering to divide up his land among his three daughters based on who loves him the most, is soon driven mad by the move. It’s a meaty, contradictory role that’s attracted such diverse actors as Laurence Olivier (twice), Orson Welles, James Earl Jones, Kevin Kline and Ian McKellen, who starred four years ago in a production by the Royal Shakespeare Company that ran at BAM under the direction of Trevor Nunn. Here, Michael Grandage directs what promises to be an insightful, moving investigation into of one of Shakespeare’s most revered -— and one of his most popular — tragedies. Melillo isn’t the only one excited about the company coming to Brooklyn. 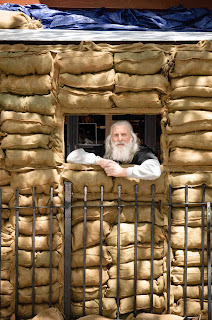 “King Lear” at the BAM Harvey Theater [651 Fulton St. at Rockwell Place in Fort Greene, (718) 636-4100], April 28-June 5. Tickets $25-$80. For info, visit www.bam.org. No, this isn’t “Spider-Man,” but a new aerial show from the Williamsburg-based Grounded Aerial, running at the Brooklyn Lyceum from now to 29. “Insectinside” at the Brooklyn Lyceum [227 Fourth Ave. at President Street in Park Slope, (718) 857-4816], now through April 29 at 8 pm. Tickets $15 in advance, $18 at the door. For info, visit www.brooklynlyceum.com. For its next big bash, the Brooklyn Museum is looking for inspiration in its own backyard. The Prospect Heights cultural institution hosts its annual gala on April 27 — and Brooklyn artists will be the honorees. That means honoring borough-based artists Fred Tomaselli, Lorna Simpson and Fred Wilson, all of whom have had exhibitions at the museum in the past year. The dinner will also feature table settings designed by 15 local artists. “My table design explores an urban/spring theme and utilizes the beauty found in cast off objects such as copper pennies, tempered automobile glass, and barbed wire,” said Williamsburg artist Ryan Humphrey, who will also include a silk-screened cassette with each guest’s name on it as a take-away gift. And for the requisite bit of Manhattan glamour, Sarah Jessica Parker (pictured) will host the pre-gala cocktail party. SJP, of course, is famous in these parts for producing the controversial art reality show, “Work of Art,” which gave the winner the ultimate perk: an exhibition at the Brooklyn Museum. The museum gala varies wildly from year to year. At least year’s, food artist Jennifer Rubel created edible pieces that paid homage to such artists as Jackson Pollock and Marcel Duchamp. Brooklyn Artists Ball at the Brooklyn Museum [200 Eastern Pkwy. at Washington Avenue in Prospect Heights, (718) 638-5000], April 27 at 6 pm. Tickets $500 to $1,500, with tables ranging from $5,000 to $50,000. For info, visit www.brooklynmuseum.org. So write Jean Tang and Sarah Reistad-Long in their new cookbook, “The Big New York Sandwich Book,” about Fort Defiance’s much-praised muffaletta. 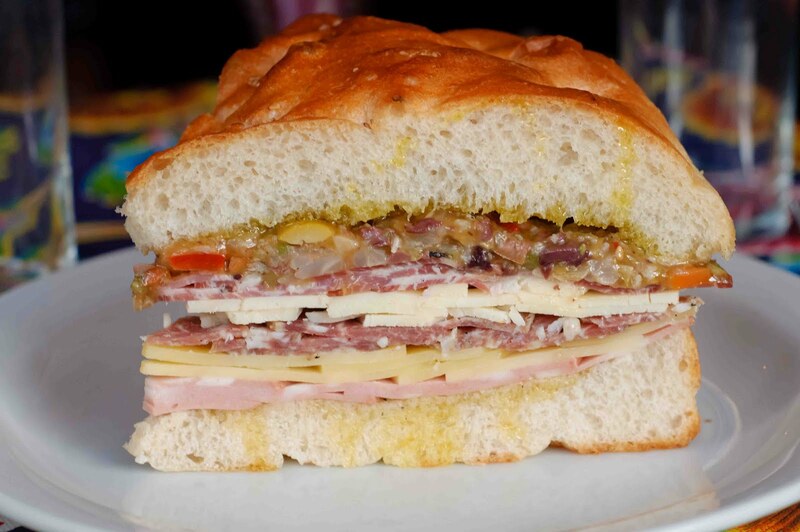 Indeed, St. John Frizell has gained many fans at his Red Hook restaurant for his take on the New Orleans classic — piled high with Emmental cheese, provolone, mortadella, sweet soppressato, and, of course, olive salad. And now, you can try your hand at recreating the tasty French Quarter staple, courtesy of the recipe below (though allow at least three days to create a proper olive spread). Place the sugar, water, and vinegar in a saucepan to make a brine. Heat to a boil over high heat; then reduce the heat to medium and boil until the sugar is dissolved. Place the carrot, cauliflower, celery, and shallot into a large, heat-proof container. Pour the brine over the vegetables to cover. Refrigerate for at least three days. Remove the vegetables from the brine. In a large mixing bowl, combine the pickled vegetables, olives, pimientos, garlic, parsley, and capers. Working in small batches, add the vegetable mixture to a food processor, and pulse until chopped, but not puréed. Toss with the olive and canola oils. Slice the bread in half lengthwise. Spread the olive salad on the bottom half. Add the Emmental, provolone, hot coppa, mortadella, and soppressata. Close the sandwich. Slice into six wedges, and serve. Store any leftover olive salad in the refrigerator. From “The Big New York Sandwich Book” by Sara Reistad-Long and Jean Tang (Running Press, 2011). Emotional. Gorgeous. Sad. Haunting. Celebratory. That’s how the frontwoman of Shenandoah and the Night describes the songs on the band’s forthcoming self-titled album (you can catch them live on Saturday at Brooklyn Bowl). Those serve it well, but we thought we’d also refer to the math of the Mus-o-meter to give you a sense of what this new act brings to the scene. 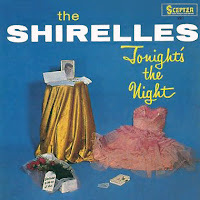 A touch of doo-wop from The Shirelles 1961 debut, “Tonight’s the Night.” The result? 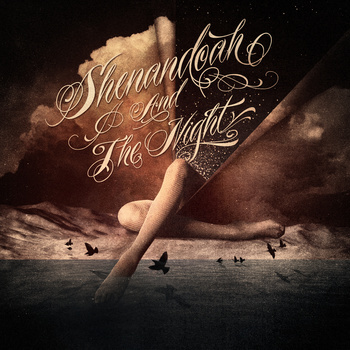 Shenandoah and the Night’s new self-titled EP. Who can you always count on when you’re in a bind and need a good book? Your neighborhood bookstore, of course, whose employees read all the newest books before you do. That’s why we’re launching this semi-regular column featuring must-reads, handpicked and written about by the staff at some of our favorite independent bookstores in Brooklyn. “The Imperfectionists” is one of the most original stories I have come across as it follows the lives of a group of people working at an international newspaper based in Rome, Italy. Each chapter introduces us to a new character while maintaining the common thread of the life of the newspaper. 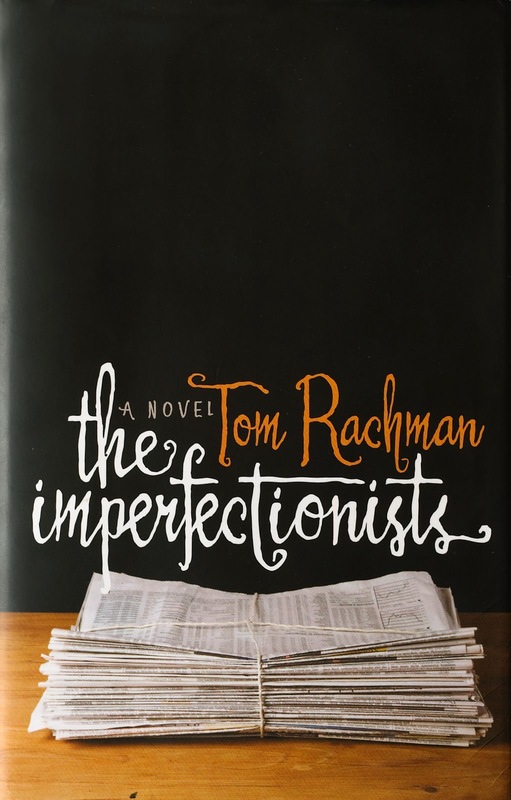 It still amazes me how author Tom Rachman was able to capture the pivotal point in a character’s life while showing all of their imperfections. This is a must-read! 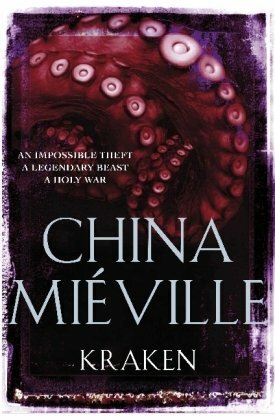 We’re big China Mieville fans at Greenlight, and his newest novel in paperback, “Kraken,” is suspenseful, thought-provoking, sometimes scary and often funny — perfect for springtime beach or park reading. In fantasist Mieville’s version of London, the supernatural realm is the territory of gangland thugs, cult leaders and a special branch of the police. They’ve all got theories about the coming apocalypse — which seems to be connected to the magical disappearance of a rare giant squid from a museum. Full of unforgettable images and bizarre characters, the novel is a race against time and through Mieville’s incomparable imagination. My favorite thing about “Kitchen Daughter” is how it defies expectation. The premise sounds gimmicky: a woman with undiagnosed Asperger’s loses her parents, her buffer from the world, and whilst fighting with her sister over her future discovers she can summon ghosts by cooking their favorite recipes. I know, I know. But author Jael McHenry (a contributor to Culinate and other food sites) unites these precarious plot elements beautifully. 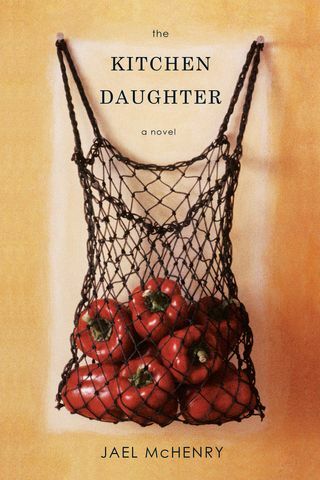 Dark and hopeful by turns, “The Kitchen Daughter” is a moving, unaffected novel about the ways that grief can simultaneously derail us and open new doors. — Jenn Northington, event manager, WORD [126 Franklin St. at Milton Street in Greenpoint, (718) 383-0096]. Coming up in the city during the late 1980s, John Popper was no slouch — he’d play five, maybe six gigs a week. Eleven gigs in a row was the record to beat. Popper could give his younger self a run for his money. Nearly 20 years after “Run Around” got stuck in our heads, Blues Traveler is still touring pretty much constantly. And Popper’s new side project, the Duskray Troubadours, isn’t letting up either, with an East Coast tour that brings him to Brooklyn Bowl on April 22. He describes the resulting band as the scrappy, roots-rock alter ego of Blues Traveler — so don’t expect quite the same epic, rocking tunes when they play Brooklyn Bowl. The Brooklyn show is a bit of a homecoming for Popper, who lived in Park Slope and Fort Greene during the late 1980s, though he has long since traded Bergen Street and Ashland Place for a place north of Seattle. 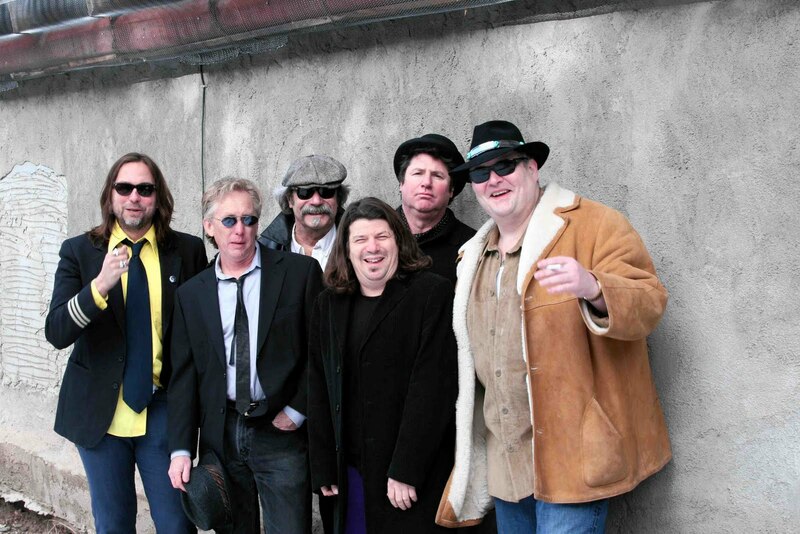 John Popper and the Duskray Troubadours at Brooklyn Bowl [61 Wythe Ave. between N. 11th and N. 12th streets, (718) 963-3369], April 22 at 8 pm. Tickets $10. For info, visit www.brooklynbowl.com. Making dessert during Passover is a bit of a challenge. The Jewish religious holiday forbids the consumption of grain-based products — or chametz — so that means no flour, baking powder or baking soda, the staples of dessert recipes. For a safe landing this Passover, which begins on April 19, Wiseman was kind enough to share his recipe for a pistachio dacquoise, which consists of layers of meringue and buttercream, so no flour needed. The pistachio helps add texture, as well as a nice color, to the dessert. The nut goes along nicely with his chocolate buttercream — though almost any filling will do. “It could be decadent and luxurious, or very light and simple,” said Wiseman. After a heavy Seder meal, the latter would be advisable. 6 egg whites at room temperature. Preheat oven to 300 degrees and roast the pistachios for 10 minutes. Remove from oven and let cool to room temperature. Place pistachios in a food processor and chop to coarse crumb texture (reserve 1/4 cup for garnish). Reduce oven temperature to 150 degrees. Line three cookie sheets with parchment paper and draw a nine-inch circle on each piece of paper. Combine 1-1/2 cups of sugar and the 1/2 cup of cold water in a small saucepan over medium heat. Place a candy thermometer in the syrup and bring up to 230 degrees. Meanwhile, whisk the egg whites by hand over a double boiler until warm. Place the whites into a mixer and whip on high until stiff peaks form. Slowly pour the syrup into the beating egg whites until very stiff. Fold the chopped pistachios into the meringue with a rubber spatula. Place mixture into a pastry bag fitted with a straight tube and pipe concentric circles onto the parchment paper three times. Bake at 250 degrees for two-and-a-half hours or until the meringues are crisp. Once cool, remove the parchment (disks may be wrapped individually and stored for up to one week). Chop chocolate into small pieces and place into a bowl. Dissolve the powdered instant coffee in the 2 teaspoons of boiling water. In the top part of a double boiler, combine the coffee, the chocolate and brandy over low heat until smooth. Set aside. In an electric mixing bowl with paddle attachment, cream the margarine until smooth and set aside. Combine 1/3 cup of water and the 1/2 cup of sugar and boil until the syrup reaches 230 degrees. Meanwhile, whip egg yolks until light and frothy on high speed. Slowly pour the heated syrup over the yolks while still beating on high speed. Continue mixing until the yolks are cool to the touch and add in the softened margarine, one teaspoon at a time. Add the chocolate mixture and blend well (buttercream may be kept refrigerated for several weeks). Spread the buttercream over each layer of meringue and repeat three times. 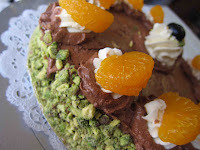 Continue to coat the sides with buttercream and garnish with remainder of chopped pistachios. Pipe rosettes with fluted tipped pastry bag, around the top of the dacquoise if desired. Chill to set and serve at room temperature. A political cabaret that features the Beep! This restaurant really has balls! 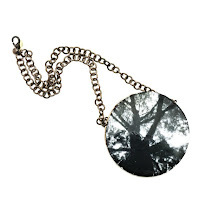 Would you wear this necklace? Pigeon a La Plancha, anyone?